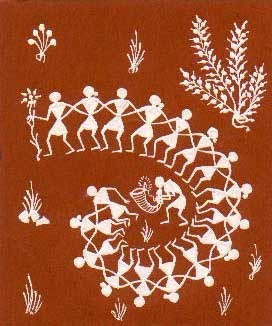 Warli painting is a tribal art mostly done by Adivasi from North Sahyadri Range in India, i.e. in western India . Warli is the name of the largest tribe found on the northern outskirts of Mumbai, in Western India. Despite being in such close proximity of the largest metropolis in India, Warli tribesmen shun all influences of modern urbanization. 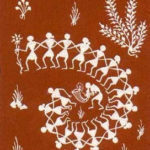 Warli Art was first discovered in the early seventies. While there are no records of the exact origins of this art, its roots may be traced to as early as the 10th century A.D.
Their extremely rudimentary wall paintings use a very basic graphic vocabulary: a circle, a triangle and a square. Their paintings were monosyllabic. The circle and triangle come from their observation of nature, the circle representing the sun and the moon, the triangle derived from mountains and pointed trees. Only the square seems to obey a different logic and seems to be a human invention, indicating a sacred enclosure or a piece of land. So the central motive in each ritual painting is the square, known as the “chauk” or “chaukat”, mostly of two types: Devchauk and Lagnachauk. Inside a Devchauk, we find Palaghata, the mother goddess, symbolising fertility. 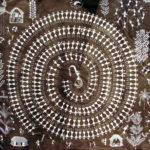 Significantly, male gods are unusual among the Warli and are frequently related to spirits which have taken human shape. The central motif in these ritual paintings is surrounded by scenes portraying hunting, fishing and farming, festivals and dances, trees and animals. Human and animal bodies are represented by two triangles joined at the tip; the upper triangle depicts the trunk and the lower triangle the pelvis. Their precarious equilibrium symbolisesthe balance of the universe, and of the couple, and has the practical and amusing advantage of animating the bodies. Apart from ritualistic paintings, other warli paintings covered day-to-day activities of the village folks. 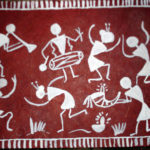 One of the central striking aspect of many warli painting is the “Tarpa dance”- the tarpa, a trumpet like instrument, is played in turns by different men. Men and women entwine their hands and move in a circle around the tarpa player.The dancers follow the tarpa player, turning and moving as he turns, never turning their back to the tarpa. The circle formation of the dancers is also said to be a resemble the circle of life. Stylistically, they can be recognized by the fact that they are painted on an austere mud base using one color, white, with occasional dots in red and yellow. This colour is obtained from grounding rice into white powder. 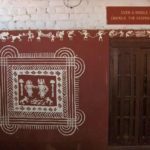 These days, even men have taken to painting and they are often done on paper incorporating traditional decorative warli motifs with modern elements such as the bicycle, etc. Warli paintings on paper have become very popular and are now sold all over India. Today, small paintings are done on cloth and paper but they look best on the walls or in the form of huge murals that bring out the vast and magical world of the Warlis. In the 1970s this ritual art took a radical turn, when Jivya Soma Mashe and his son Balu Mashe started to paint, not for any special ritual, but because of his artistic pursuits. 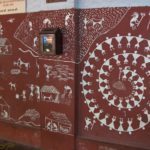 Warli painting also featured in Coca-Cola’s ‘Come home on Diwali’ ad campaign in 2010 was a tribute to the spirit of India’s youth and a recognition of the distinct lifestyle of the Warli tribe of Western India. 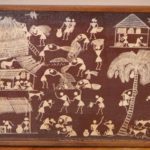 Niveditha thank you for this very enlightening article on Warli Art. Where can one look and buy authentic pieces for the home of the same? Would you be able to assist me? Thanks for the information. Where can one learn warli painting right from basics.